It is hard to express my sheer terror at watching Dracula at the Darlington Hippodrome. From the moment I took my seat and saw the set for the show, I knew that it would be truly thrilling and unsettling. My first prediction proved true. This reimagining of Bram Stoker’s classic Gothic novel (and one of my favourite books) was explosive from the first moment. Every part of the show – from the set and costumes to the lighting and sound – was designed to keep you on the edge of your seat in anticipation at what would be unearthed next. I was so engrossed in the show that it felt like no time at all passed between taking my seat and giving a roaring round of applause. The story mostly stays true to the original novel, and even keeps some of it’s more shocking and horrifying moments (I’m looking at you Lucy). 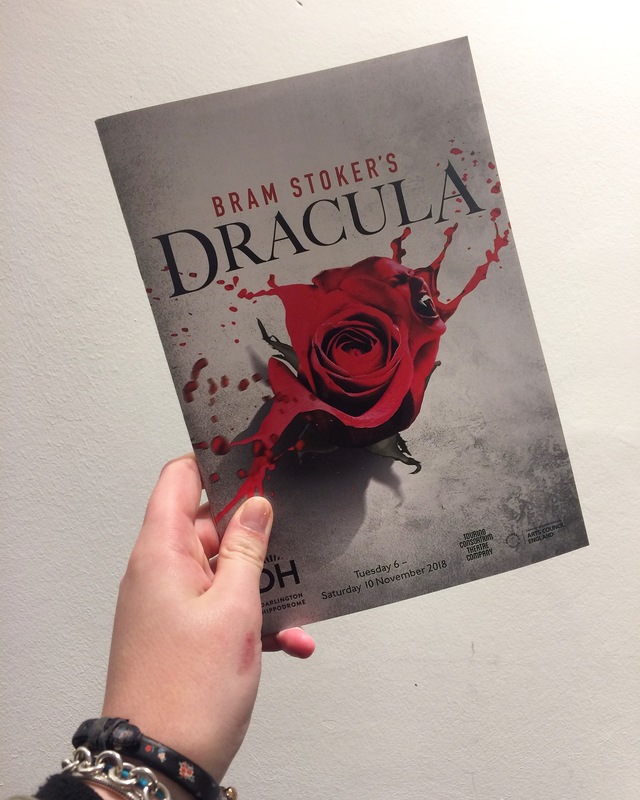 This production definitely didn’t shy away from bringing the horror of Dracula to Darlington Hippodrome. Some parts of the story have been updated however. These are still in keeping with the original narrative and fit seamlessly with Stoker’s own work. Jenny King has done a phenomenal job at adapting Dracula for this production. I’m sure that the author itself would have approved of what the creative team at Dracula have done with his story. As to what those changes are, I’m not going to tell you so that it is just as shocking for you as it was for me. Part of the shock of the show comes the brilliant job that the lighting and sound teams have done at taking this production to the next level. They were an integral part of the performance and truly elevated it. They made the show the multi-sensory experience we were promised and therefore truly terrifying. Dracula will run at Darlington Hippodrome until Saturday 10 November and I truly implore you to see it if you can. Just be ready for frayed nerves, a fast-beating heart and more than a little fear. For more information, head to the Hippodrome website. P.S I am beyond grateful for Darlington Hippodrome for providing me with two free tickets to the show in exchange for my honest review! Ooh it sounds amazing, and terrifying! The production sounds very intense.